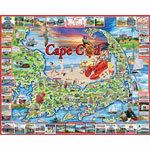 Massachusetts has amazing history, brilliant universities, fantastic sports, and local delicacies, and they are all here in one 1000 piece puzzle by Charlie Girard for you to enjoy. 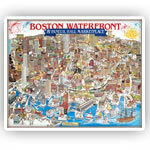 The lovely artwork of this puzzle can evoke joyous memories of home, or spark conversations of past good times. Sure to delight, share the art and fun long distance or just treat yourself! The Commonwealth of Massachusetts has produced some wicked smaht people from its many prestigious institutes of higher learning. Aside from its wealth of colonial history, the state’s championship professional teams have also earned dedicated followers whether for the Bruins, Celtics, Patriots, Red Sox or Revolution. Feast on regional favorites like baked beans, Friendly’s or a Hoodsie, Necco wafers, a Fluffernutter or seafood chowdah, and wash it all down with a frappe, a cup of coffee from Dunkin’ Donuts, or perhaps a Sam Adams. These are just some of the highlights assembled on this 1,000 piece puzzle. Includes free puzzle box stand. AMAZING BENEFITS OF PUZZLE BUILDING: Puzzles enhance motor skills, hand-eye coordination, and problem-solving skills. Delays cognitive decline, improves short term memory, mood and spatial awareness. PUZZLE ARTISTRY: Combines the artwork with the design of the cut pieces to enhance the enjoyment of the user. Complexity of cut, artistry and detail are all evident of the quality of each piece. 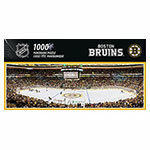 QUALITY PIECES: 1,000 extra-large, easy to handle interlocking pieces made of sturdy blue chipboard on recycled paper. Completed dimensions: 24 x 30 inches. For ages 12+. Made in USA.